Reorder checks with a new design – If you would like to choose a new look for your checks with your next order, log into Online Banking and choose Account Manager. Select Manage Accounts on the left, then Check Orders. 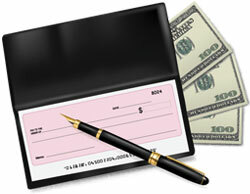 Reorder existing checks with no changes – Place an order with Harland Clarke. You'll need DCU's routing and transit number (211391825) and your account number. Please allow 5 to 10 business days for your order to reach your home. To make sure you continue to receive important information and items from DCU such as your statements, DCU Visa® Platinum Credit Cards, and DCU Visa Debit Cards, we always need your most current address on file. It's also important for us to have your current home and office phone number so we can reach you quickly if necessary. If your address or phone numbers have or will soon change, you have several options to update your information. Online Banking – Login to Online Banking and select the Update my information link under your name and address on the top right and fill in your updated information. By Phone Through the Information Center – Call 508.263.6700 or 800.328.8797, weekdays from 8:00 am to 9:00 pm and Saturdays from 9:00 am to 3:00 pm, ET. For your security, you'll be asked questions to positively establish your identity before you can change your information. By Mail or Fax – Please complete and submit the Update Contact Information form following the instructions.